A Mediterranean twist on the classic, this crowd-pleasing appetizer is packed with goodness! Fresh yet indulgent tasting & DELISH! 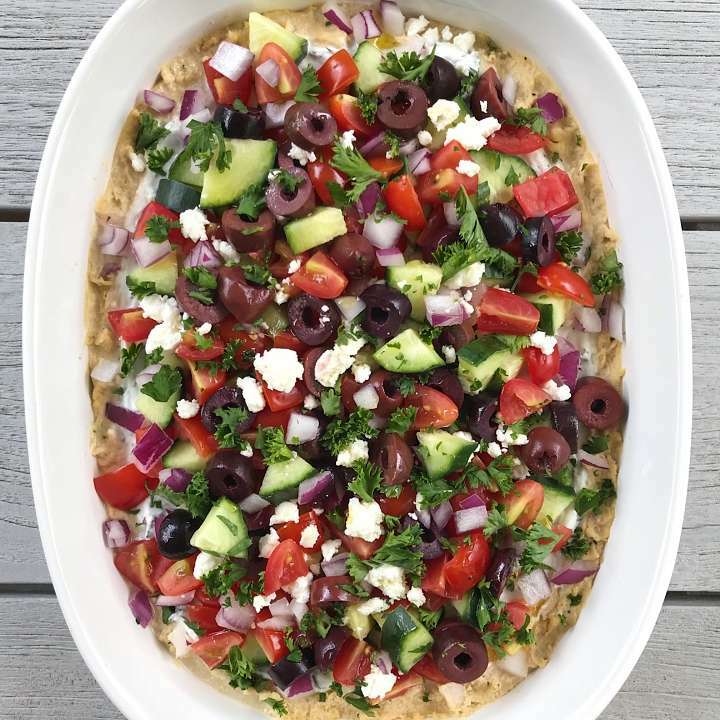 A Mediterranean twist on the classic 7 layer dip…. this Greek Dip is fresh tasting, delicious and packed with goodness! The first layer is a freshly made, creamy Hummus. Then its topped with an indulgent-tasting Herbed Yogurt Sauce. Next it’s topped with diced cucumbers, tomatoes, red onions, kalamata olives, feta (you can omit if dairy-free or vegan), and garnished with fresh parsley. So much yumm! All you need to do is grab your favorite chip and dive right in! A total crowd pleaser, this dip is a perfect appetizer (think holiday weekend party) or snack (think after school or when those pre-dinner munchies kick in). 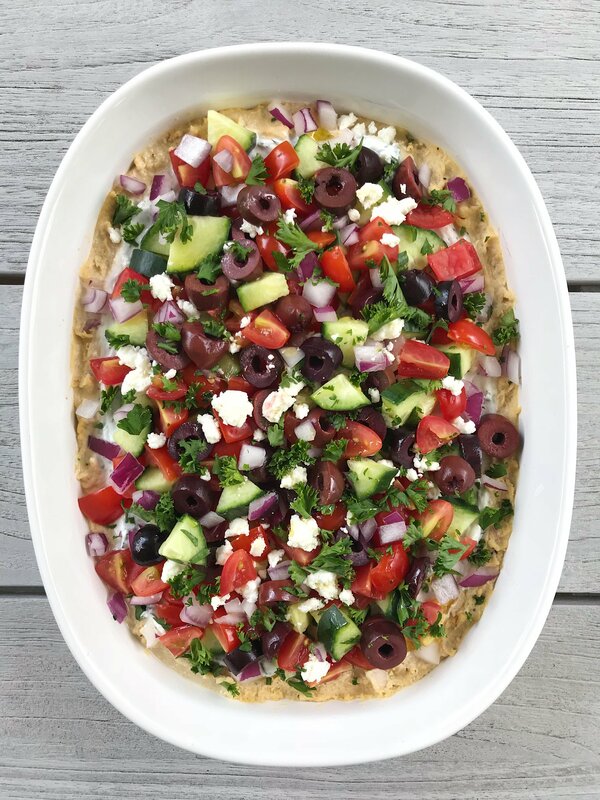 A Mediterranean take on the classic 7 layer dip.... this Greek Dip is fresh tasting, delicious and packed with goodness and a total crowd pleaser! Creamy Hummus, indulgent tasting Herbed Yogurt Dip, cucumbers, tomatoes, red onions, kalamata olives and feta. Garnish with fresh parsley, grab your favorite chip and enjoy! Place all the ingredients except the olive oil in a food processor. Add the olive oil by streaming while mixing. Process until smooth and creamy. Adjust to tastes as desired. Serve. Stores well in a sealed container in the refrigerator for a few days. Mix all ingredients together in a medium mixing bowl. Taste and add more herbs or lemon juice to taste. Lemon juice will also thin the sauce. Store in a sealed container in the refrigerator. Keeps well for a few days. Spread Herbed Yogurt Dip on top of hummus. Top with Cucumber, Tomatoes, Red onions, olives and feta. Serve with your favorite chip and enjoy!